CELEBRATE THE 50TH ANNIVERSARY OF VATICAN II! Make Vatican II more than just a chapter in church history! 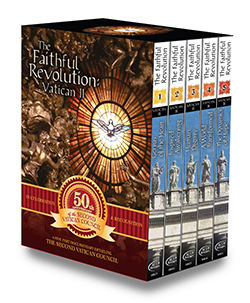 The Faithful Revolution is a must-see for parish leadership, adult faith formation, or high school and college students. This widely praised series is a must-see for parish leadership, adult faith formation groups, and high school and college students. Historic film footage coupled with insightful commentary makes The Faithful Revolution an invaluable educational resource. More than 96 Council participants and attendees, cardinals and bishops, theologians, clerics, philosophers, and laypersons were filmed for the making of The Faithful Revolution. Production executives and crew traveled to eight countries on three continents.